Pizza Hot Dog – Stahl-Meyer Foods, Inc.
Preheat over 350. Open hot dog buns and brush the inside with melted butter. Sprinkle with garlic powder. Place on baking sheet and bake until lightly golden, about 5 minutes. Preheat broiler. Spoon a little sauce onto each hot dog bun then place boiled hot dog on top. 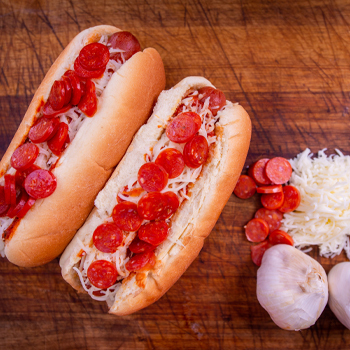 Top each hot dog with mozzarella, sprinkle with Italian seasoning, then place mini pepperoni on top. Broil until the cheese is melty, about 2 minutes.